HMPL-309; HMPL 309; HMPL309; Theliatinib. Theliatinib, also known as HMPL-309, is a novel small molecule, epidermal growth factor receptor tyrosine kinase inhibitor with potential antineoplastic and anti-angiogenesis activities. In vitro studies suggest that Theliatinib is a potent EGFR kinase inhibitor with good kinase selectivity and in vivo data demonstrated broad spectrum anti-tumor activity via oral dosing in multiple xerographs such as A-431, Bcap-37 and Fadu. To a solution of Compound 3-a (40 g, 0.138 mol, prepared according to procedures disclosed in WO2010002845), pyridine (40 mL, 0.495 mol) and DMF (anhydrous, 22 mL) in anhydrous THF (500 mL), was added phenyl carbonochloridate 3-b (22 mL, 0.175 mol) dropwise at -10°C. The mixture was stirred at room temperature for 12 hours. The precipitates were filtered and then suspended in saturated NaHC03 solution (500 mL). The solid was filtered, washed with H20 and EtOAc, and dried in vacuum to give compound 3-c (46 g). A mixture of compound 3-c (1 g, 2.44 mmol) and compound 3-d (369 mg, 2.92 mmol) in dioxane (30mL) was stirred at 70°C for 5 hours, and then cooled to the ambient temperature. The precipitates were filtered, washed with EtOAc, and dried in vacuum to give compound 3 (0.8 g). MS (m/e): 443.4 (M+l)+. To a solution of Compound 3-a (40 g, 0.138 mol, prepared according to procedures disclosed in WO2010002845), pyridine (40 mL, 0.495 mol) and DMF (anhydrous, 22 mL) in anhydrous THF (500 mL), was added phenyl carbonochloridate 3-b (22 mL, 0.175 mol) dropwise at −10° C. The mixture was stirred at room temperature for 12 hours. The precipitates were filtered and then suspended in saturated NaHCO3solution (500 mL). The solid was filtered, washed with H2O and EtOAc, and dried in vacuum to give compound 3-c (46 g). A mixture of compound 3-c (1 g, 2.44 mmol) and compound 3-d (369 mg, 2.92 mmol) in dioxane (30 mL) was stirred at 70° C. for 5 hours, and then cooled to the ambient temperature. The precipitates were filtered, washed with EtOAc, and dried in vacuum to give compound 3 (0.8 g). MS (m/e): 443.4 (M+1)+. The present invention belongs to the field of pharmacy and provides a crystal form of a compound (3aR,6aR)-N-(4-(3-ethynylphenylamino)-7-methoxyquinazolin-6-yl)-1-methyl-hexahydropyrrolo[3,4-b]pyrrole-5(1H)-carboxamide, a pharmaceutical composition thereof, and a preparation method therefor and the use thereof. 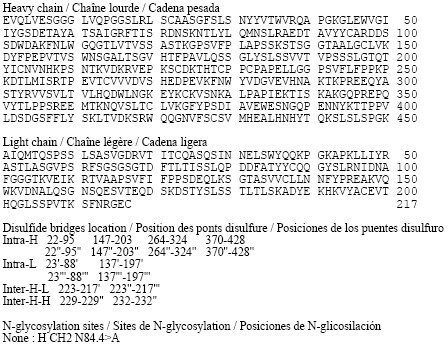 (FR)La présente invention concerne le domaine de la pharmacie et fournit une forme cristalline d’un composé (3aR,6aR)-N-(4-(3-éthynylphénylamino)-7-méthoxyquinazolin-6-yl)-1-méthyl-hexahydropyrrolo[3,4-b]pyrrole-5(1H)-carboxamide, une composition pharmaceutique de celui-ci, et son procédé de préparation et son utilisation. Novel crystalline forms of the compound presumed to be theliatinib , processes for their preparation and compositions comprising them are claimed. Also claimed is their use for treating lung cancer, colon cancer, breast cancer, ovary cancer, prostate cancer, stomach cancer, kidney cancer, liver cancer, brain cancer, esophageal cancer, bone cancer and leukemia. Hutchison Medipharma is developing theliatinib, a small molecule EGFR tyrosine kinase and AKT cell proliferation pathway inhibitor, for treating cancer, including brain tumor, esophageal tumor and NSCLC; in September 2017, positive preliminary data were presented. Hutchison is also developing epitinib succinate , for treating cancer including glioblastoma. Binding of epidermal growth factor (EGF) to epidermal growth factor receptor (EGFR) activates tyrosine kinase activity and triggers a response that leads to cell proliferation. Overexpression and/or overactivation of EGFR can lead to uncontrolled cell division, and uncontrolled cell division can be a cause of cancer. Therefore, compounds that inhibit the over-expression and/or over-activation of EGFR are candidates for treating tumors. Relevant compounds of the present invention (3aR, 6aR)-N-(4-(3-ethynylphenylamino)-7-methoxyquinazolin-6-yl)-1-methyl-hexahydropyrrolo [3, 4-b]pyrrole-5(1H)-carboxamide, whose chemical structure is shown in Formula A, has the effect of effectively inhibiting overexpression and/or overactivation of EGFR. Therefore, it can be used for the treatment of diseases associated with overexpression and/or overactivation of EGFR, such as the treatment of cancer. Before discovering the crystal form of a compound, it is difficult to predict (1) whether a particular compound exists in crystalline form; (2) how an unknown crystal form is made; (3) what the properties of the crystal form would be, such as stability , bioavailability and so on. Since the properties of the solid depend on the structure and the nature of the compound itself, different solid forms of the compound often exhibit different physical and chemical properties. Differences in chemical properties can be measured, analyzed, and compared using a variety of analytical techniques that ultimately can be used to distinguish these different solid forms. Differences in physical properties, such as solubility and bioavailability, are also important in describing the solid form of the drug compound. Likewise, in the development of pharmaceutical compounds, such as compounds of Formula A, the new crystalline and amorphous forms of the pharmaceutical compounds are also important. 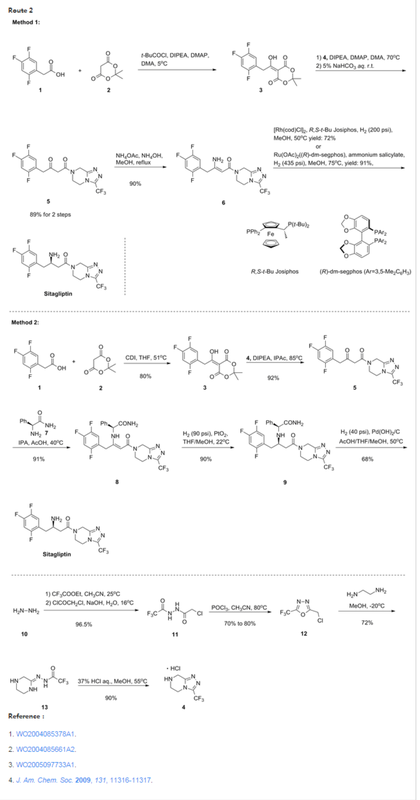 Patent CN102906086A discloses compound (3aR,6aR)-N-(4-(3-ethynylphenylamino)-7-methoxyquinazolin-6-yl)-1-methyl-hexahydropyrrolo[3 4-b]pyrrole-5(1H)-carboxamide and its preparation method. at -10 ° C, to (40g, 0. 138mol, was prepared in accordance with the operation disclosed in W02010002845) Compound 3-a, pyridine (40mL, O. 495mol) and DMF (anhydrous, 22mL) in dry solution (500 mL) in THF dropwise phenyl chloroformate 3-b (22mL, O. 175mol). The mixture was stirred at room temperature for 12h. The precipitate was filtered off, and then it was suspended in saturated NaHCO3 solution (500mL). The solid was filtered off, washed with H2O and EtOAc, and dried in vacuo to give compound 3_c (46g). Compound 3-c (lg, 2. 44mmol) and the compound 3_d (369mg, 2. 92mmol) in a mixture of two anger dioxane (30mL) was stirred at 70 ° C 5 h, then cooled to ambient temperature. The precipitate was filtered off, washed with EtOAc, and dried in vacuo to give compound 3 (O. 8g). MS (m / e): 443. 4 (M + 1) +. Theliatinib (HMPL-309) is a novel small molecule, epidermal growth factor receptor tyrosine kinase inhibitor with potential antineoplastic and anti-angiogenesis activities. Theliatinib is being developed as an oral formulation for the treatment of solid tumors like non-small cell lung cancer. Theliatinib pre-clinical studies were conducted in China. In vitro studies suggest that Theliatinib is a potent EGFR kinase inhibitor with good kinase selectivity and in vivo data demonstrated broad spectrum anti-tumor activity via oral dosing in multiple xerographs such as A-431, Bcap-37 and Fadu. Non-clinical safety studies have indicated that Theliatinib is generally well tolerated in animals. In November 2012, HMP initiated the first-in-human clinical trials of theliatinib. ahead of print] PubMed PMID: 28472779. By DR ANTHONY MELVIN CRASTO Ph.D in PHASE 1, PHASE1 on June 13, 2018 .